Have you been to our NEW Vetstore yet? We are offering FREE shipping! Over 3000 products available! Spring is an important time to start on flea/tick preventives both dogs and cats. We live in a high risk Lyme area. Contact us for protection that works best for your pet. 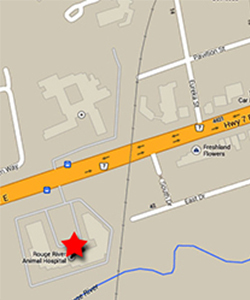 Rouge River Animal Hospital, your Unionville/Markham Animal Hospital is pleased to provide Laser Therapy for your best friend! Our mission is to provide the highest standard of compassionate veterinary care for all pets. Although dogs and cats are our main patients we also see guinea pigs, rabbits, gerbils and birds. Sick Pet? Check out the Pet Health Checker! 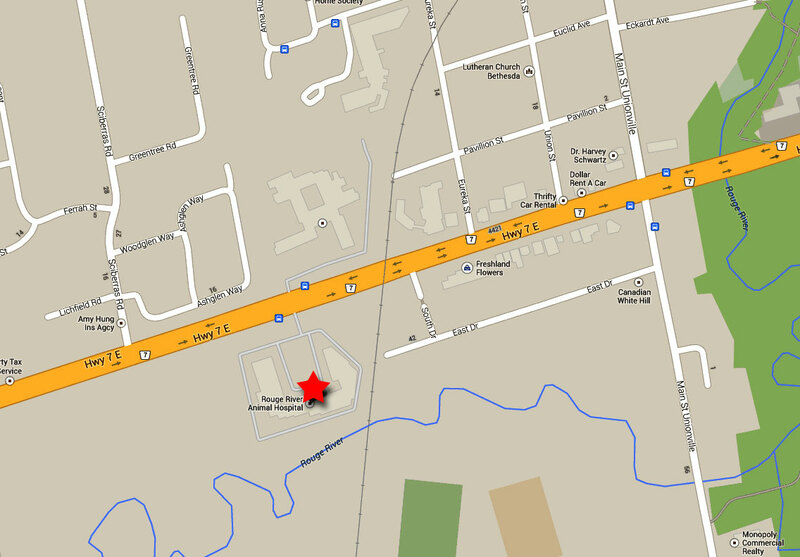 Local directions: We are located in the Shoppes of Unionville Plaza on the South side of Hwy 7 west of the railroad tracks.